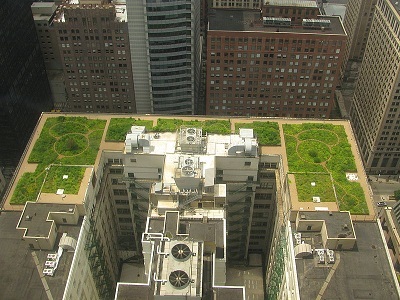 A green roof is partially or completely covered with vegetation and a growing medium, planted over a waterproofing membrane. Green roofs usually do not involve construction of complex drainage and irrigation systems. The use of “green” refers to the growing trend of environmentally friendly and does not refer to roofs which are merely colored green, as with green roof tiles or roof shingles. There are different ways in which green roofs are constructed. Container gardens on roofs is one of the type of green roof, where plants are maintained in pots, are not generally considered to be true green roofs, although this is an area of debate. Rooftop ponds are another form of green roofs which are used to treat greywater. It has various advantages and serves several purposes such as absorbing rainwater, providing insulation, creating a habitat for wildlife, and helping to lower urban air temperatures and combat the heat island effect. Intensive roofs are thicker and support a wide variety of plants and are heavier requiring more maintenance. 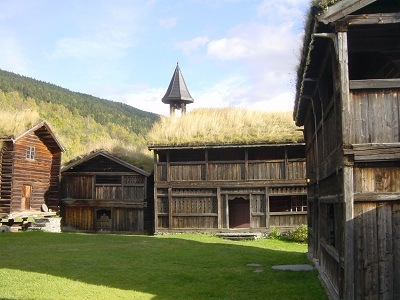 Extensive roofs are covered in a light layer of vegetation and are lighter than an intensive green roof. The term green roof may also be used to indicate roofs that use some form of “green” technology, such as a cool roof, a roof with solar thermal collectors or photovoltaic modules. The hierarchy of plant life offers an extensive palette for a landscape designer to draw from. Many types of vegetation can be used in a very effective way to modify the micro-climate of the site. (Source: www.rooftopservices.com) Vegetation can be classified as grass, low shrubs, high shrubs, deciduous trees, evergreen trees etc. The growing medium typically made up of a mineral based mixture of sand, gravel, crushed brick, peat, organic matter and some soil. It varies in depth between 5-15cm (2’-6”) with a weight increase of between 72.6-169.4 kg/m2 when fully saturated. Lightweight roofs generally does not require reinforcement. It is suitable for large areas. It involves low maintenance costs and has long life. There is no need of irrigation and any specialized drainage system. Often suitable for retrofit projects. It looks more natural and is relatively inexpensive. Less energy efficiency and storm water retention benefits. Roof insulation can be provided using a roof system of precast hollow terracotta curved panels with nominal GI reinforcements. A nominal layer of concrete of only 2” thickness at the crown of panel was poured into place. The hollow terracotta layer works as heat resisting layer. Effective roof insulation can be provided using vermiculite concrete. It reduces the roof construction by 60%. Roof insulation can be provided by terracotta tiles flooring above the waterproofing material and lime concrete is laid. This entry was posted by Benzu JK on May 13, 2010, 5:11 pm and is filed under Sustainable Design. You can follow any responses to this entry through RSS 2.0. The use of “green” refers to the growing trend of environmentally friendly and does not refer to roofs which are merely colored green. That was a good idea. Thank you. It was amazing roof. But that was a great idea to have a green environment. They can smile the fresh air. Thank you for the idea. I like your your inclusive attitude towards the various forms of “green roof” and am v grateful for the additional resources. Anyone interested in signing a petition to encourage world leaders to adopt more green roofs can sign up. Thank you for the great idea. That was a fantastic roof. I like your your inclusive attitude towards the various forms of “green roof” and am v grateful for the additional resources. Thank you. That was fantastic. I like your your inclusive attitude towards the various forms of green roof and am v grateful for the additional resources. Thank you. Wow, this is a new concept for roofing that I learned today. Certainly, the idea is good. In what countries are green roofs applied in? In what seasons will a green roof survive? 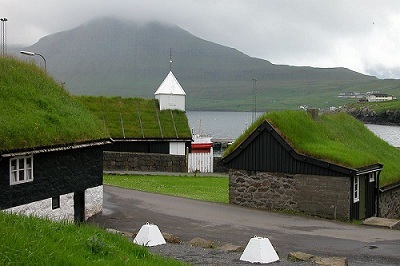 Green Roofing Technology is applicable in any country in any type of climate. Really a great green technology! I’ve gone through your article and found it very informative.